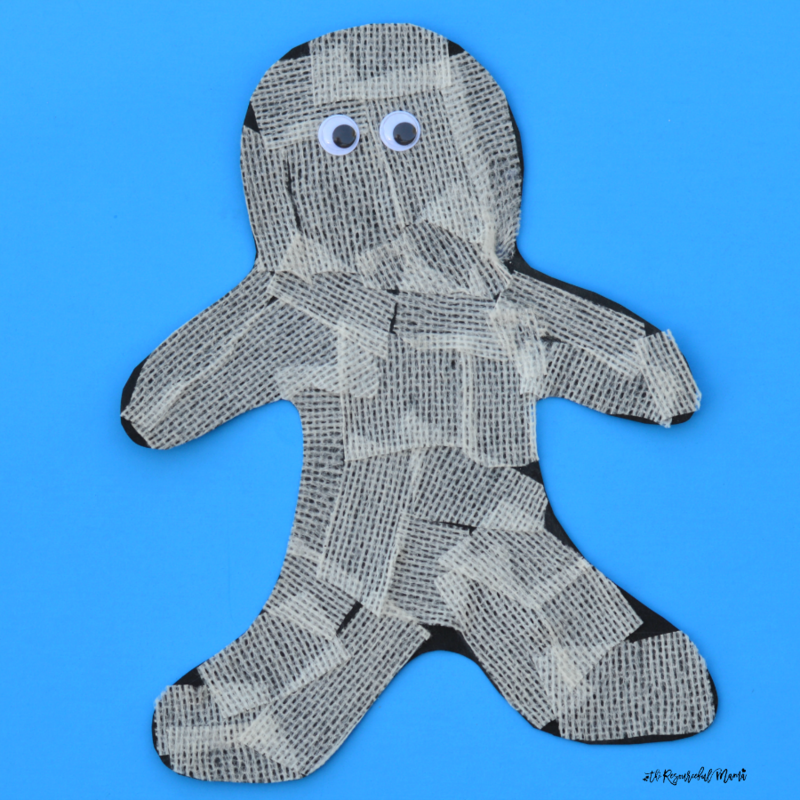 This gauze mummy craft came about from an overstock of gauze bandages. One of our kids on a dare this summer dislocated his elbow as well as a bone in his elbow. Not a fun time, but he was lucky and able to wear a splint most of the time rather than a hard cast. When I dug out my box of medical supplies for tape, I was shocked at how much gauze we had on hand. With three kids, we get our fair share of bumps and bruises, but a simple band-aid usually takes care of those and if not we are usually making a mad dash to the ER. As Halloween approaches and I’m still left with more gauze than we need even after donating some, so we decided to make a gauze mummy craft. If you don’t happen to have an overstock of gauze like we do, you could use masking tape or pieces of torn white paper. 1. Using your mummy template, draw a mummy outline on the black paper. 2. Cut the gauze into smaller pieces and strips. Gauze can be difficult to cut for some preschoolers, who are new to using scissors, so you may need to help with this step. 3. Glue the pieces of gauze to the mummy. 4. Glue googly eyes to the face of the mummy. 5. Cut out your mummy craft. I did this step for my preschool, since the line we had traced was hard to see. You could also string these together to make a mummy banner for your home or classroom. Our preschooler had fun with the googly eyes. She thought her mummy needed a nose, mouth, fingers, and toes, which is great that she is identifying and labeling those body parts. Serve a mummy themed lunch. Wrap juices boxes, boxes of raisins, and fruit or yogurt squeeze pouches with gauze or medical tape and glue two googly eyes to the front. Make quesadilla mummies or hot dog mummies. Make each other into mummies by wrapping each other in toilet paper.